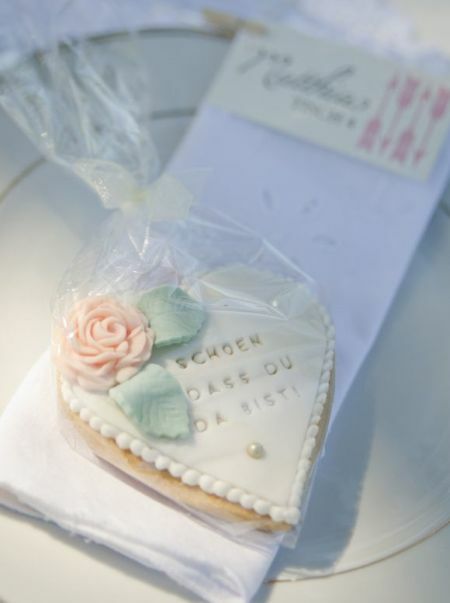 Decorated wedding cookies are a delicious, edible work of art. 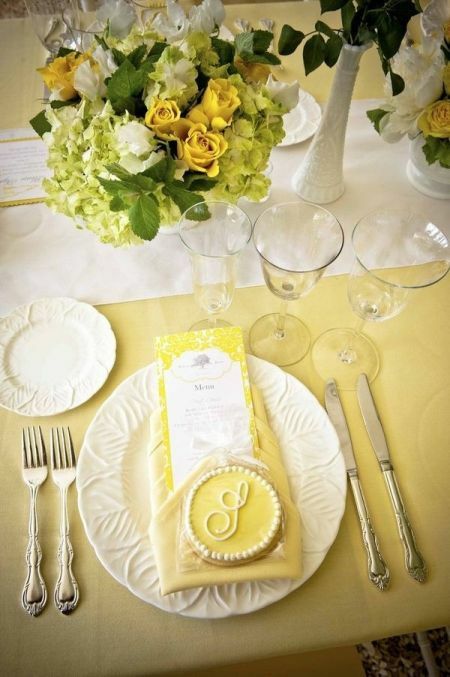 Today, there are tremendous amounts of cookie choices and designs that celebrate your own personal style. Whether you want a hint of sparkle, an accent, a modern touch, or a flash of glam, you can find cookies that are the perfect match for you. 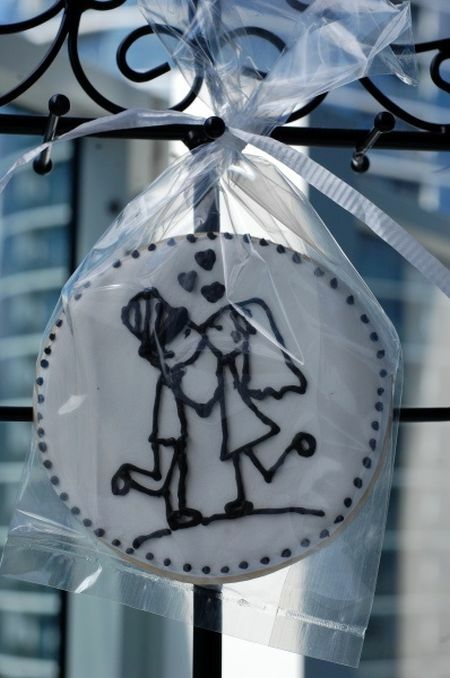 Make your wedding distinct by having a modern gourmet cookie favor that not only looks elegant, but tastes amazing. 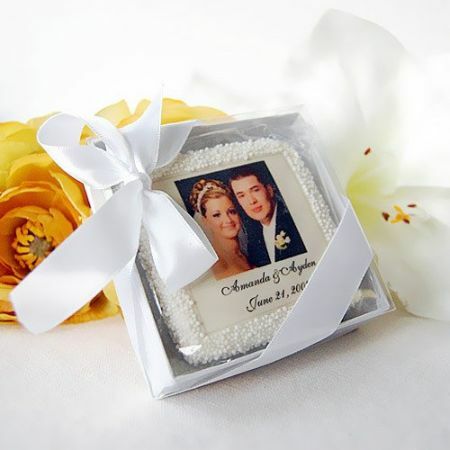 The success of wedding cookie favors is the thought and attention given to selecting the one you love. Traditional favorites include cookies in the shape of a wedding cake, heart, wedding dress, champagne glass or bottle. If you are planning a spring wedding, perhaps a flower shape such as a bright, vivid Gerber daisy. Summer or beach weddings would go great with a flip-flop, starfish or seashell design. For fall weddings, autumn themed sweetness would be appropriate such as pumpkins, oak or maple leaves. And snowflake shaped cookies would be perfect for a winter wedding wonderland. So, face the challenge of selecting a decorated wedding cookie that is fabulously fresh, unusual, and different. Staging an unforgettable cookie display for your guests will ensure that they get more out of your favors than a sugar rush. Choose decorated wedding cookies that celebrate the pleasure of the moment and arrange them artfully to be admired by guests. Indulge yourself, it's all about seizing the moment and enjoying it. The cookie favors at your table should be selected and placed as carefully as the china. This table setting is an elegant choice from top to bottom with timeless appeal. 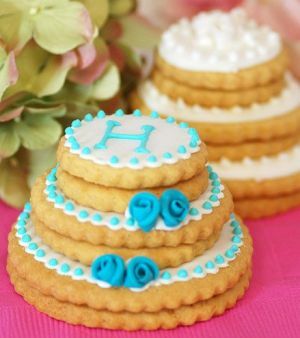 This cookie idea gives you the chance to show off you new initial to its best advantage. 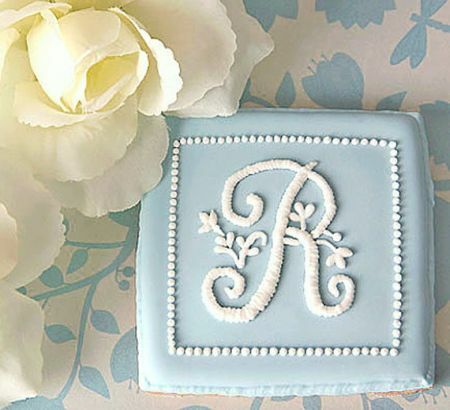 The soft blue tones and intricate detail almost make the cookie look too pretty to eat. The framework for this custom cookie favor begins with a meaningful photo. Completely edible, you can count on this being an opportunity to communicate the joy of the occasion. Let them eat cookie cakes. It's always a pleasure to have the chance to do something blissful with your cookies. 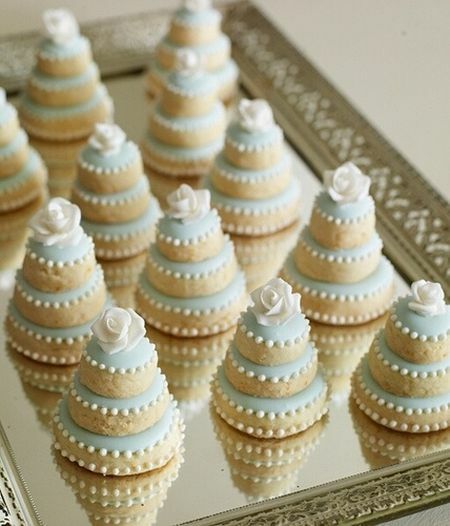 In keeping with the spirit of the blessed event, decorating cookies to look like wedding cakes is a lovely thought. The beautiful message and homespun charm make this cookie design ideal. Adding colorful accents and a matching ribbon serves as an extension of the wedding decor. With a little inspiration and a minimum of fuss, cookies can be stacked to create a really special cookie wedding cake. Here, extra decorative elements were incorporated in the form of color and intricate detailing. This cookie is the epitome of timeless prettiness. Decorated with a single pale pink rose and dainty white pearl, simplicity was allowed to do its job. 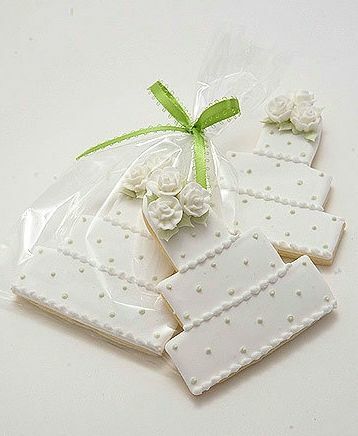 This decorated wedding cookie will bring a smile to everyone's face before they take the first bite. 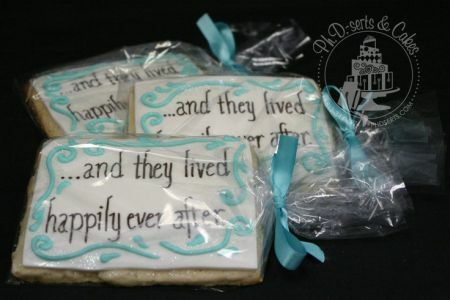 These amazing cookies will not only be excellent wedding favors for children, but also for the adults. Everyone will think that you are one smart cookie for giving such a great gift. 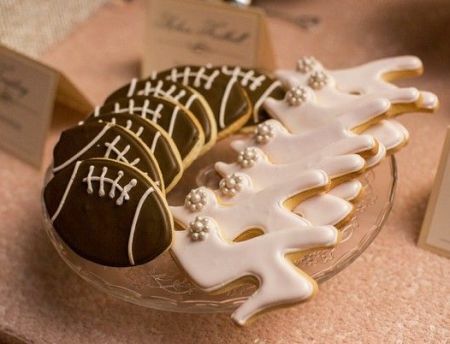 When he loves football and she love shoes, let it show in the cookie designs. Only do them if they are truly meaningful to the bride and groom, because that's what it is all about. Spoil your guests with beautiful little bags of cookies. 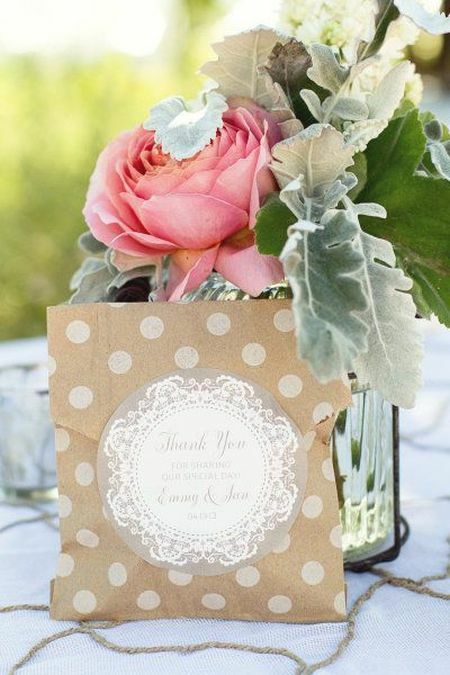 A thank you message that captures the spirit of the occasion makes this goody bag extra special.